Music and dogs have been my whole life, and I have been blessed to have two professional careers–vocalist and dog trainer. I have shared my voice, my love of music, and my love of dogs with just about everyone I have met. I retired from singing to focus more of my time on Mikamar. My favorite type of dog training is agility. There is an incredible feeling of joy when my best buddy and I are running or playing together. When we connect and communicate just right, and add the rush of running full speed in sync, it is simply amazing! 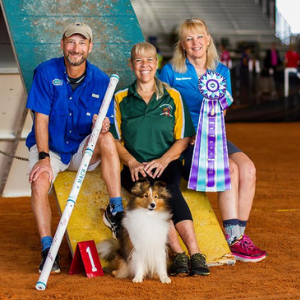 Originally from Long Island, in 2004 I discovered this beautiful location here in Florida and built our home and a full size outdoor canine sports complex, where we teach and hold a variety of events and offer public education on dog behavior. I have also mentored students from colleges and public school. In 2016, I added a 40’ x 50’ covered arena to use during rainy days. As a professional dog trainer, I believe in training with leadership, understanding, and respect for our best friends. I have found that it is more than just about positive training. 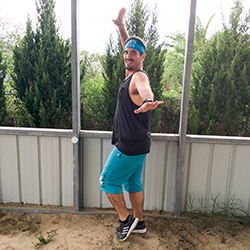 I believe in spreading a message of a positive attitude …training is FUN and rewarding here! I look to get inspired and to inspire others. I am also earth-friendly and believe in the use of purely natural products wherever possible, so I research and try them out on a regular basis. 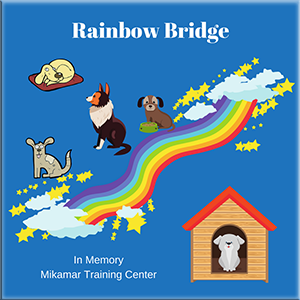 In the Mikamar retail store, I sell natural dog treats, raw food for dogs, and natural products that work to reduce toxins in the environment, and also some natural treats and foods for sports competitors. You can read more on my Natural Healing Gal blog as well. I have heard many times about how a dog has changed a person’s life…and how we have helped people keep their dogs by teaching them what their dog needs, like food and play rewards, lots of exercise and good health, in addition to “dog language”. It is all about having fun with your dog to help promote that special bond, getting people and dogs off the couch and back to play! I know that each of our pets are in our lives for a reason, and they have taught me so much, including that all things are possible. Why is your dog in your life—and what is he or she here to teach you? What got you started in dog training? I grew up with dogs and had a very deep connection with them from a very young age. I began to read everything I could get my hands on almost as soon as I could read. I spent most of my time with them and learned to train all kinds of tricks from the books I read. What are some of your proudest moments with the dogs? I am proud of them for everything they do, from the simplest tasks to the times they rise above the norm. One that comes to mind though, is when I was a teenager, I had a German Shepherd, Sabina. There was a large dog across the street who was aggressive and we were afraid of him, so we knew when he went out so we could avoid him. One day he came out at an unexpected time, charged straight for me, and Sabina got between us and protected me. I still remember how scared her voice sounded. She was so brave. She actually fought him back until I could get into the house safely and call the owner. Thankfully he did not hurt her before his owner came out and took him home. I was just a kid who had trained her to do some pretty neat tricks, but I did not know about being responsible and keeping her safe. Apparently, she knew more than I did! What are some of your experiences with dog training? I have met some wonderful people and dogs along the way. I have heard many times how a dog has changed someone’s life. One of my favorite teachers was Patty Ruzzo, who passed away a few years ago, and who I will never forget. She was a pioneer in positive reinforcement, proved that it worked to the entire dog training community, and changed my life forever. I never considered a harsh training method after working with her. I am currently training and showing a client’s Rottweiler who is continuing to demonstrate that reinforcement with treats and toys works, with any breed. I began to train dogs at local clubs and volunteer at shelters when I was 20. I soon began to show in competitions with my German Shepherd and Doberman Pinscher, assisted in training classes for some years, then became an instructor. 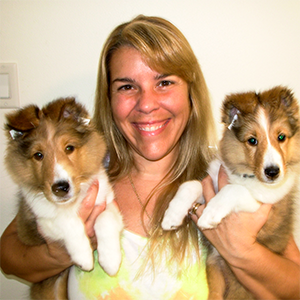 I was certified by the Society of North American dog trainers in 1995. It was the first time a certification was available for dog training. From there I continued my education by going to workshops and seminars presented by some of the most prominent and experienced trainers and behaviorists, and I continue to further my education in dog behavior today. I believe it is important to keep up with the latest knowledge, and I learn more all the time. What have you learned from the dogs? The dogs have taught me so much throughout the years. They taught me how to be a better trainer and instructor, how mistakes are a valuable learning tool, and that all things are possible. I have learned some unexpected lessons from them. In my quest to keep my dogs as healthy as possible, I have learned so much about nutrition, and how one “diet” is not right for everyone. I learned that I needed to be a vegan even though my dogs are carnivores that eat real meat in a way that their cousins, the wolves, would eat. How is Mikamar different from other training places? We are proud that we strictly adhere to gentle and effective methods of training regardless of the breed or type of dog, or the challenges we face. Mikamar is a fully force free facility and our students get the results they need. We continually change and evolve our training methods, and explore new ideas. It is possible to be competitive AND still be kind! What is your goal with Mikamar Training Center? Our goal is to encourage a strong bond between the owner and the dog, and to make it enjoyable for both. My students tell me their dogs begin to show excitement in the car, when they make the turn towards our training center! 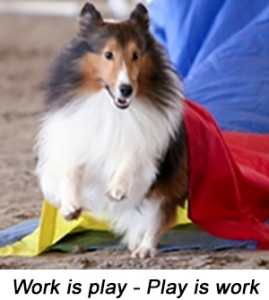 What do you love about agility competition? I love that feeling of being “in the zone”, when my buddy and I are in sync, running full speed through a course. We are a team. There is a rush that is indescribable until you feel it for yourself. What is the best piece of advice you could give someone with a dog? Teaching your dog “human language” is important; but if you learn your dog’s language you will develop a much stronger communication system and be more successful. Listen to what they are trying to tell you. The core technique in dog training involves reinforcement and removal of reinforcement (operant and classical conditioning). If your dogs could talk, what would they say about you? Has your life gone to the dogs? That is funny, it reminds me of Camp Gone To The Dogs, which was a week long camp that my dogs and I went to for many years in a row when we lived up north. I have many fond memories of that place. I think my life went to the dogs the moment I was born!